Since the removal of impacted teeth is an important matter for both the patient and the Oral surgeon, it is necessary for you to thoroughly understand the reasons for their removal and the normal side effects which may follow. All teeth are formed deep within the jaw bones. As the roots develop the tooth travels towards its future place in the dental arch. This is called eruption. If the tooth travels in the wrong direction, or is blocked by another tooth or some dens bone it is said to be impacted. Unerrupted teeth are normal in childhood, but not in adults. The teeth that are the most frequently impacted are the 3rd molars or wisdom teeth that should erupt between16 and 21 years of age. There is usually not enough space for them and they can cause crowding of the other teeth within the dental arches. The upper canine teeth or eye teeth are also frequently impacted and they erupt between 11 & 13 years of age. We can often mechanically erupt them in to the correct position with the help of orthodontic appliances. The premolars or any other tooth that has lost its way can also be impacted. So to, the extra or supernumerary teeth that develop from time to time can be either impacted or erupted and they very often obstruct other teeth from erupting normally. What harm do impacted teeth do? * Infection of surrounding gum i.e. Pericorenits. * Referred pain i.e. Headaches, earaches, sore throats, sinus pains Etc. As a basic rule all impacted teeth in patients over the age of 21 should be removed, There are however exceptions to this and they should be discussed with the doctor who is going to be treating you in consultation with the doctor who has referred you. If a patient with an impacted tooth waits until it causes trouble, he/she may first have to be treated for the infection or other complications before the operation for removal can be done. This means additional loss of time and expense as well as some added risk. Many ordinary teeth can be removed using extraction forceps. 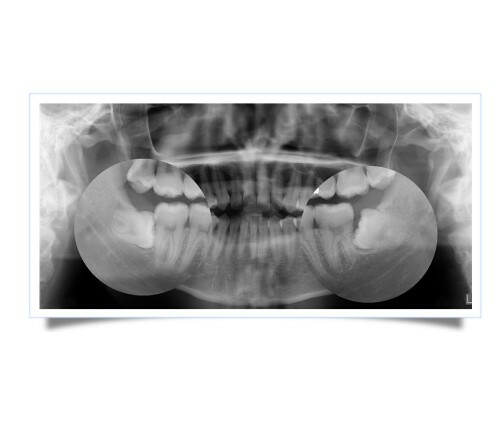 This is of course not possible with impacted teeth as they are partially or completely under the surface. We consider the removal of impacted teeth an operation in every sense of the word. This is not meant to frighten you, but to give you better understanding about certain features regarding the careful preparation, cost and the need for good after care. The removal of impacted teeth can be compared amongst other with tonsillectomy, appendectomy, mastoidectomy or cataract operations. The actual removal of the tooth is done in keeping with surgical principals, with meticulously sterilized instruments, good light, a dry operative field and gentle handling of the soft tissues and bone. Depending on the difficulty of the procedure it may take from ten to sixty minutes. The wound will be closed with dissolving sutures. In certain, less severely impacted cases the removed can be done under a local anesthetic in my consulting rooms. This needs to be discussed with me or my ladies before the time. Conscious sedation for Oral surgical procedures is a very contentious issue and carries a high degree of risk so I’m not personally in favor of it out side of a fully equipped theater and then one can just as well have a full anesthetic Certain Health care funders only allow for the removal of impacted teeth under local anesthetics and I feel that it is for me to decide weather they can or can’t be removed in this way. These matters need full clinical examination and evaluation before any decisions of this nature can be made. Postoperative instructions for your home care comfort will be furnished (can be download from this sight).Patients are generally put on special drugs to minimize swelling, reduce discomfort, prevent infection, promote healing and aid in oral hygiene. Follow your own inclinations as to diet, but for your own comfort stick to a soft-liquid diet. Keep taking nourishment. Try (not to skip a single meal. Begin by eating soft foods or liquids such as heavy soup, milk shakes, so boiled eggs, cereals etc. As soon as possible change o solid food. lf you are a diabetic, maintain your normal diet and take your medication as usual.